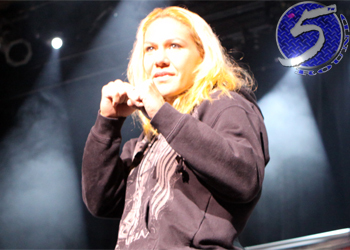 Tito Ortiz just did Cris “Cyborg” Justino (pictured) the biggest favor of her life – that is, if you were to ask UFC president Dana White. Ortiz has officially stepped down as Justino’s manager, presumably helping ease her path towards the Octagon. “I can live with Dana not liking me but what I can’t live with is Dana using me to hurt someone else. I’ve taken abuse and maybe I deserved some of it but Cris is a beautiful person and great athlete and doesn’t deserve to be insulted like this. I don’t understand how Dana lets his hatred towards me hurt the UFC and the fans by not making this fight. He accuses her of still using banned substances and say that she isn’t worthy of fighting Ronda yet a year ago he personally called me to make the fight happen. I never said she would die if she made 135- we just repeated what the Dr said that Cris shouldn’t make a career at 135- we offered a 3 fight deal they said no 7 fights or no deal. I’m also tired of Dana accusing Cris of using banned substances. I challenge you to put up or shut up- Test her or stop lying about her- Cris is a beautiful woman inside and out- don’t insult her on her looks- she may be tough as nails but she still has feelings. Ortiz’s announcement comes a day after White went on an absolute tirade in front of a small group of media members at the UFC corporate office in Las Vegas when asked if the promotion would bring Santos over to challenge reigning UFC bantamweight champion Ronda Rousey. White’s biggest rebuttals in signing Santos is that she “isn’t clean,” claims the featherweight can’t shed the 10 pounds required to compete in the UFC’s bantamweight division and that Ortiz, White’s longtime rival, is her manager and is making things extremely difficult. The much-anticipated shootout is the biggest fight in women’s MMA history. Santos is currently Invicta FC’s featherweight champion, but the all-women’s promotion has a great relationship with the UFC and it wouldn’t be an issue for her to transfer to the UFC. For example, the UFC acquired 11 of Invicta’s top strawweights to add to their newest weight class. Santos allegedly claimed her doctor told her she might die if she fought at 135 pounds. However, that story changes depending on who you ask. Santos tested positive for stanozolol metabolites after steamrolling Hiroko Yamanaka in December 2011. That was the only time she flunked a drug test in 14 professional fights. Rousey is the UFC’s biggest mainstream star, and many believe White has been protecting her by not signing Santos.